Newfound commercial laundry bags are built to last. Constructed from our purpose made 300-denier polyester twill fabric, known as Durotech (also known as Sharkskin laundry bags). 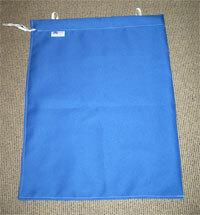 Used in commercial and very demanding laundry environments these are heavy duty laundry bags. Bottom handles inside and out. 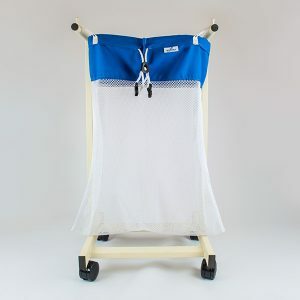 Our industrial quality washnet laundry bags are intended for use in commercial, institutional and industrial environments that place a high demand on the quality and also the durability of their laundry handling equipment. 100% polyester heavy duty mesh fabric. Heavy polyester binding on all seams offering protection to both the seam and the garments inside the bag. Durable coil zip with metal slider. Elastic cover for the zip slider in the closed position ensuring the bag stays closed in the wash and protecting the inside of the washer / dryer from exposure to the metal slider. Polyester webbing hanging loop that also functions as a labelling surface. Standard with zip top, cord and lock, toggle or open top also available. Non Standard wash-net bags available – made to order. Available in white with colour tags or identification on special request.